Cardboard sides with inner core. 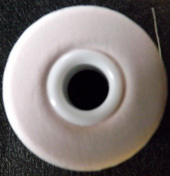 These bobbins are made from 100% Polyester filament thread ticket 180. Each bobbin has 143 yards of thread and there are 144 per box. These are standard 'L' Type bobbins.